As cats like familiar surroundings it can be a traumatic experience for both the animal and the owner if they have to spend time in a cattery. One solution is for us to come to your home. We can visit once or twice a day as required to see to their specific needs. If you have several cats we like to have photographs of them so that we can identify them easily and give them the individual attention they require. As well as dealing with feeding and cleaning, we factor time into our visits for socialisation and play as this is important for the wellbeing of your cat. During the initial consultation we take care to listen and note your specific requirements for the care of your pet. Cleaning out litter tray and clearing up any accidents! 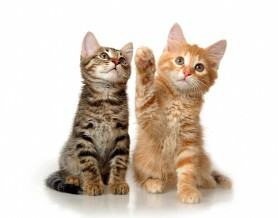 Prices are based on up to 4 cats additional cats are charged at £1 per cat.